For the control of the trains and the signals in a model railroad, the computer has to know in wich section of track are located the trains, for that, it needs to know wich sections are occupied, this is done by occupancy detectors and the signal of these is connected to a feedback module that informs to the command station and this to the computer, the common ones are S88 and RS. Also the feedback modules can be connected directly to the PC by means of GenHSI interface for the S88 or the RS2PC interface for the RS. The signal of the ocupation detector arrives at one of the inputs of the RS feedback modules (it is connected to ground) and this informs of the change by the bus RS to the command station or the interface RS2PC that informs to the PC for the control of the scale model. In order to program the PIC you have to use this HEX file. 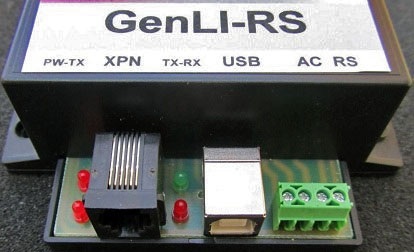 GenLI-RS is configured at 19200b and works with PC programs that support the LI100F interface from Lenz. This is the feedback module for RS bus with 8 inputs. Connect to the inputs only optocoupled detectors or dry contact. The programming of the number of the module is made in a simple way pressing the button and then from the command station selecting a number of accessory and driving it. By means of the button it's also possible to show with the LED the programmed number of the module. It includes visualization of lack of bus RS. The programming of the number of the module is made in a simple way pressing the button and then from the command station selecting a number of accessory and driving it. By means of the button it's also possible to show with the LED the programmed number of the module. It includes a detector of voltage of the DCC signal, by means of which if by any cause there is no voltage in the track (short circuit, etc..) the module 'frezzes' the inputs until the retun of the DCC signal avoiding 'track free' feedback in case of power failures. It includes visualization of lack of bus RS and lack of DCC signal. 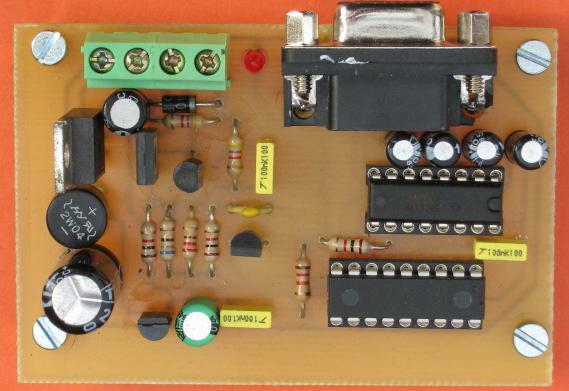 To build your own Optical Control Panel (TCO) with LED. Takes data directly from the bus RS installed between the command station (or RS2PC) and RS modules. You can program each individual LED to show a occupancy input illuminated fixed or flashing. Several LED can display the same occupancy input and you can have multiple TCO joined with just 3 wires. The programming of the number of the module is made in a simple way pressing the button and then changing the state of the feedback input to be monitored. By means of the button it's also possible to show in the LED their programmed number of feedback input. It includes visualization of lack of bus RS. 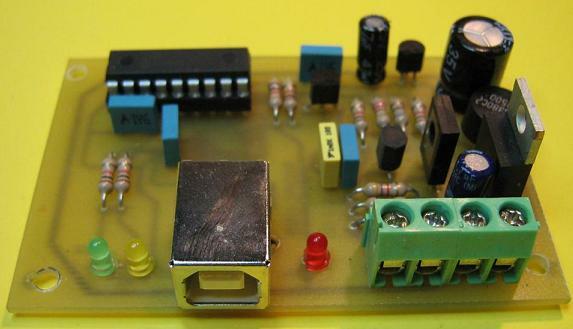 To build your own Optical Control Panel (TCO) with LED. Takes data directly from the DCC signal installed as extension of RS-TCO. You can program each individual LED to show an accessory output illuminated fixed or flashing. Several LED can display the same accessory output and you can have multiple TCO joined with just 3 wires. The programming of the number of the module is made in a simple way pressing the button and then changing the state of the accessory output to be monitored. By means of the button it's also possible to show in the LED their programmed number of accessory output. It includes visualization of lack of DCC signal.